Now a days whenever you hear the word network you may think more about social networks than railroads and power lines. But board games tend to be a little bit more old fashion so you’re likely to be a rail baron than a blogger when you sit down to the latest hot game (at least I don’t think there are any games about social networking yet). So get your conductor’s hat on, or whatever rail barons wear, and get ready to build a network to span the globe. Oh, we can’t build railroads under water yet? Never mind, let’s leave the globe spanning to the social networkers after all. Network and Route Building: How Does It Work? 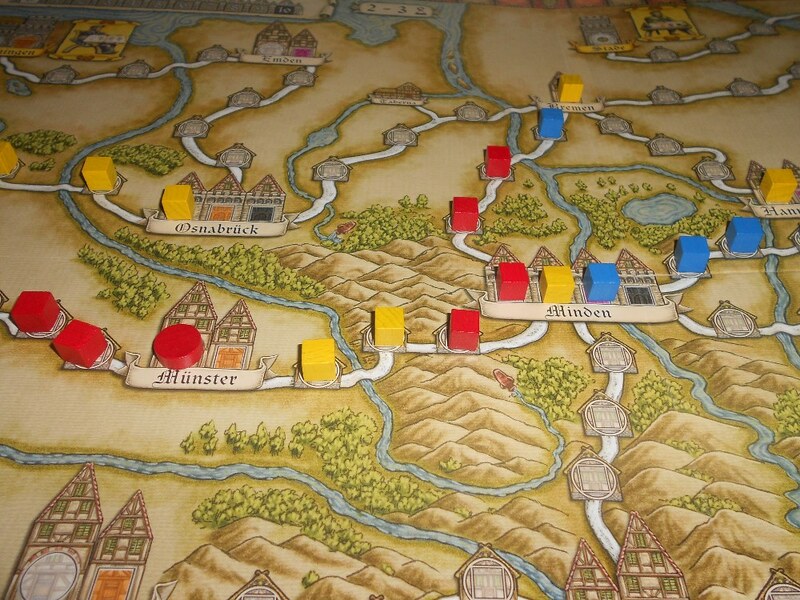 Network and Route Building games have players utilize and build networks usually by playing pieces on a board to show their progress. Building is most often permanent as players expand their presence on the board rather than moving pieces around. The purpose behind building your network can vary from connecting locations to expanding into new territory with the intent of developing that area. Networks generally exist to connect one location to another and often to interconnect a whole series of locations. The way that locations are utilized generally takes one of two forms, what I will refer to as Established and Constructed locations. Established locations exist at the beginning of the game and it is the player’s job to build the network to connect them. Conversely, Constructed locations do not exist at the start of the game and require the players to build them as they develop their network. Settlers of Catan has a fairly simple implementation of Constructed locations. Players only have one type of location to build, Settlements, but they can decide where they want to build them. Constructed locations tend to leave the game more open ended, the player has more freedom over what to build and where to build it. Oftentimes structure is helpful and Established locations provide more direction to the player allowing them to focus more on just building routes. There are various different ways that players are able to build their networks during a game. The most common is for players to be given one or more starting points and any building must be connected to one of those points. Players are thus limited to only expanding out from their established presence on the board. 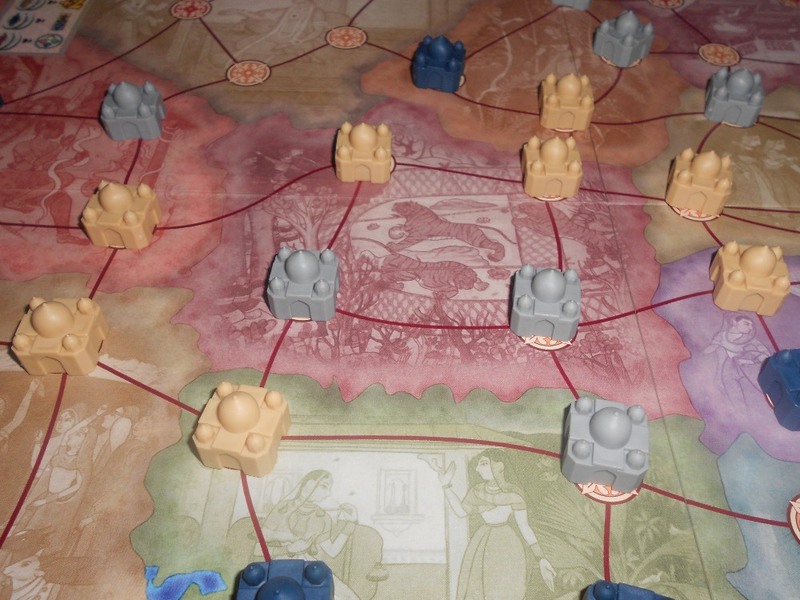 A more open-ended approach allows players to build anywhere on the board often with the intent to eventually combine their networks or balance several separate networks consecutively. Players are not always just building up their own personal network however, some games have the players working together to develop one or more networks. Sometimes the players will have a shared interest in a network and they can develop it better by working together. In some cases the network is already in place from the start of the game and the players can use the network to develop locations along the network. Power Grid is a great example of this having the players claim cities along an established network which indicates how expensive it is to traverse its routes. How you go about building your network is another factor that further distinguishes games using Network Building. Having some sort of economic system in place is perhaps the simplest implementation where constructing your network pieces has an associated cost and your expansion is only limited by how much you can spend. Based on the board you might be laying down tiles, placing cubes or pieces on preset routes, or even drawing in your route as you build it. Card driven systems are a great alternative to an economic system, implementing Hand Management or Set Collection into the building process. Rather than spending money, players can play cards from their hand to expand their network. Ticket to Ride has players discarding sets of cards that match symbols on the board to claim routes. Express 01 allows the players to actually use the cards themselves, playing them on the board to develop their network. Rolling Freight uses Dice Rolling to provide opportunities for construction by expending dice. And in case you were wondering if someone had taken a stab at mixing in some Deck Building yet, Trains has you covered. So we know what a network looks like and how it is constructed but what is the purpose of building the network in the first place? This often depends on how Network Building is combine with other mechanics. In a pure Network Building game, such as Ticket To Ride, the whole purpose of the game is to build your network not to use it. In this style of game players are given connection goals or are vying for board control in some manner. Taj Mahal has a very crowded board, can you manage to make some connections? 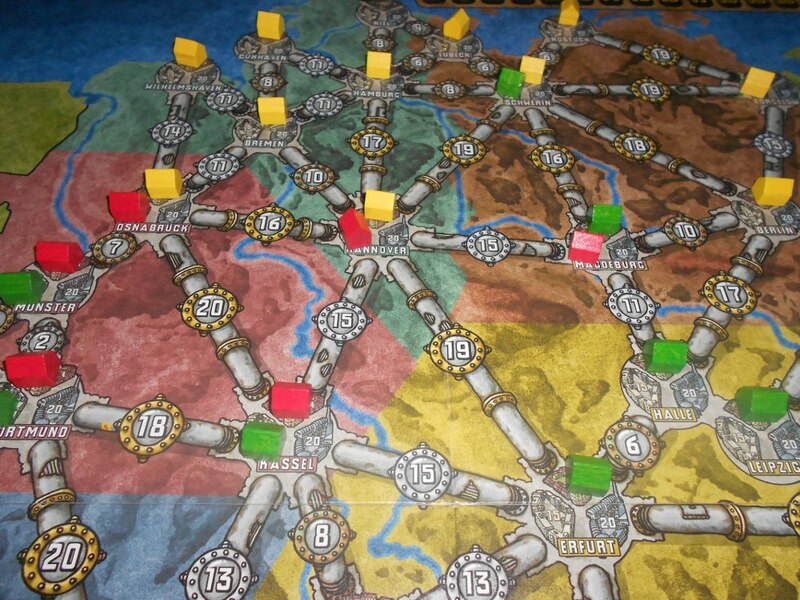 One of the most common implementations of Network Building is railroad games ranging from 18xx to Steam to Chicago Express to Ticket to Ride. Railroad building is so ingrained in western culture that it is both extremely intuitive and (somewhat) instantly appealing. There is a wide variety of how railroad games combine Network Building with other mechanics, Stock Holding and Pick Up and Deliver being two of the most common. Stock Holding encourages players to share in the construction of the different networks rather than each player controlling their own personal network. In this case the purpose of the network is to increase the value of the railroad so that your investment will pay off. This still puts the emphasis on building as that is often how the value of a railroad will increase, by expanding and connecting to important locations. A better example of a mechanic that lets you actually use the network that you build is Pick Up and Deliver. The connections that you’ve made between locations can then be used to move goods around the map and deliver them to locations that demand them. Delivering goods often provides resources with which you can further expand your network. One of the main advantages of Networking Building games is that provide a gratifying representation of your progress throughout the game. You can see your network develop as you build roads, lay track, or whatever your connecting pieces of choice may be. Rather than just having a victory point track tell you how well you are doing you can just look at the board and have a good grasp on how you’re comparing to the other players. This lead to a highly visual style of play that is very intuitive for new players and easy to teach. The action in Network Building tends to be very goal driven generally dealing with the locations on the board. Whether it’s connecting two locations to each other or adding more locations to your network to increase its value, the goals tend to be easy to grasp and provide very clear incentives to the players. There are often a good mix of short term and long term goals that guide players through the various stages of the game. There are also literally multiple “paths” to victory. The very nature of Network Building challenges players to assess various different routes to build or paths through a network and pick the best one. But adaptation is necessary as all the players are competing over the same space and it’s not as simple as choosing one route and sticking to it. If it was truly the best then surely the other players would notice too and compete for or completely block it off. There’s a reason why Ticket to Ride has been such a big success, it plays to all of these advantages so well. People are given clear goals they can see and understand (tickets) but are allowed to achieve them by various different means (routes). Players often start with very little and build their network from the ground up. This can tend to be a little slow in the initial stages of the game as players gather resources to start constructing their network. The board is very open and options are plentiful, you need to do a lot of planning at the start so that you can lay the groundwork for what your network will operate on. The game can almost feel front-loaded at times where you do a large amount of planning at the beginning and then simply execute it over the course of the game. There will tend to be some tactical decisions to make as you race for key spots or adjust your course but you almost always need to have a general plan for your development. Network build can also tend toward optimization as you scheme to build your network in the most efficient way possible. If you can save a couple bucks here or there then you can expand your network more when it counts. This can lead to games that are lower on interaction as players plot their routes and only notice the others players when they get in the way. The shared board that all players are building on creates a real sense of interaction but depending on how crowded things are you may be merely reacting to other players rather than interacting with them. 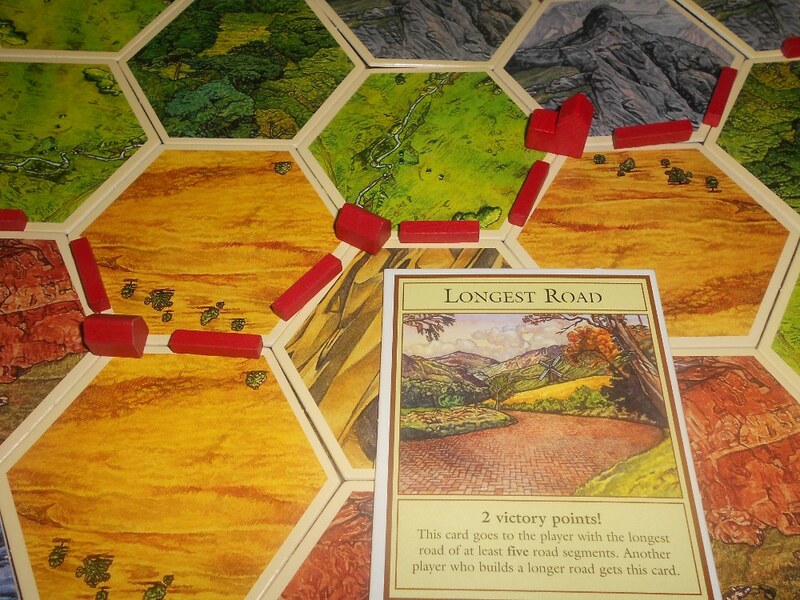 The Settlers of Catan: The gateway game that brought many gamers into our wonderful hobby. Players race to get their settlements into the most bountiful spots on the board be building a network of roads and settlements. And don’t forget to connect your starting settlements and sneak in a victory with the “Longest Road”. Ticket to Ride: Another gateway of choice offers the chance to travel the world and connect cities that you know and love (or maybe haven’t even heard of). The focus is squarely on building your network keeping the design nice and clean. Power Grid: This classic takes economic Network Building and combines it seamlessly with auctioning and resources management. There’s a real sense of development as players claim the cities, upgrade their power plants, and buy resources from a market that changes as the board fills up.Railways of the World (again): In the Steam family, this one places the most emphasis on actually building your network. By giving you the freedom to build however you want and with a larger area to do so Railways really opens up the experience of being a rail baron. Taj Mahal: Networking in India can be a challenging prospect and Taj Mahal does a great job of challenging players to try and create connections on the crowded board. You don’t need to create a large chain of connected palaces to win but players can focus on it as a good source of points. Airlines Europe: In this game, players do not own individual networks. Instead, the networks represent airlines that all players can invest in. Growing an airline’s network (claiming licenses) increases the value of that company’s stock. However, each airline has a limited number of expansions to work with, so players can manipulate the maximum value of airlines, for better or worse, by claiming valuable routes or by wasting expansions on less valuable ones.Kingdom of Solomon: There are interesting network-building aspects that mix with worker-placement. Workers are placed in different regions each turn to collect resources, but you can also build permanent buildings and roads on these same regions to connect them. Doing so gains resources from all the regions in your network with a single worker placement. Trains and StationsWhat are your favorite Network Building games? What do you love (or hate if you’re a grump) about Network Building games? How many games will come out this year that have the word Trains in the title? I can’t wait for Trains and Stations to come out. I got to try it at GenCon and it will be perfect for my family. Our kid and her friend enjoy TtR, but they aren’t old enough to do the long term planning it needs. But T&S seems more about optimizing each turn (like Yatzee). Perfect for kids!